We took a trip in our van and I love it ...Was the first time away from our home in four years . Thank you so much for my freedom Kathy..
Our commitment to manufacturing top quality handicap accessible vans and our low price guarantee* on all newly modified minivans makes AMS Vans one of the largest manufacturers in the business. Once you buy a wheelchair van from AMS Vans, we can deliver it to you in Terre Haute, Indiana or nationwide (delivery fees may apply), which includes our white glove service where a mobility professional will show you how to use the ramp and optional mobility equipment on your new minivan. Once you&apos;ve seen your modified handicap vehicle from our inventory in person, if you aren&apos;t completely satisfied upon delivery, you can send it back. New AMS Vans handicap conversions on new or used wheelchair accessible vans are backed by our incredible conversion warranty, 24-hour emergency conversion help line, and nationwide service. 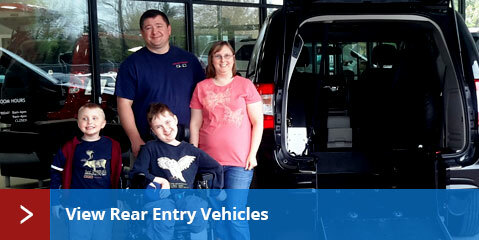 Handicap van conversions are available on new and used minivans. Conversion packages like the AMS Vans Edge, AMS Vans Legend, or AMS Vans Edge II can modify your current new or used Dodge, Chrysler, Honda, or VW minivan into an AMS Vans brand wheelchair van. Accessible mobility equipment add-ons such as jump seats and hand controls are available for installation to customize your wheelchair van to your specific needs. AMS Vans has new minivans modified with wheelchair ramps for sale to Terre Haute, Indiana and across the country. Wheelchair van conversions are available on Honda, Dodge, Chrysler, or Volkswagen minivans in either side or rear entry models. Keep more money in the bank with mobility rebates often offered by minivan manufacturers on new vehicle sales. AMS Vans offers certified pre-owned handicap vans with new and used conversions from AMS Vans as well as used accessible vehicles from Braun, VMI, Rollx and other wheelchair van manufacturers in Terre Haute, Indiana and across the country. Experience less depreciation by buying used minivans rather than new. Buying a used handicap van with a new conversion from AMS Vans keeps the remainder of the manufacturer&apos;s warranty on the van intact in addition to an incredible conversion warranty. Sell your un-modified minivan or wheelchair minivan for one of the highest offers in the industry. AMS Vans is interested in buying your used minivan or mobility van and offers one of the highest payout quotes available, a quick turnaround to get your money to you as fast as possible, and national pick-up right in Terre Haute, IN. 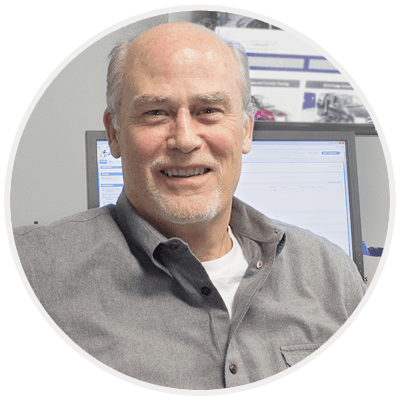 Even if your used mobility van was manufactured by AMS Vans or one of our competitors like Braun, VMI, or Rollx, we are still interested in buying your vehicle direct. You can rest assured that your price quote on selling your used wheel chair van to AMS Vans is one of the highest available. AMS Vans brand handicapped vehicles are eligible for our great Buy Back Program when you are ready to sell or trade in, and you will get some of the best prices in Terre Haute, IN. 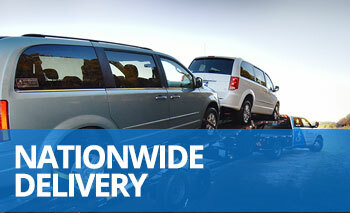 You can sell your late model, un-modified Honda, Dodge, Chrysler, or Volkswagen minivan to AMS Vans direct. After we buy used minivans, we modify them into used handicap vans with new ramp conversions as a low cost option to purchasing a new handicap van. Find buyers and sellers of accessible vans and other modified vehicles in a "for sale by owner" environment. When it comes time to sell your used AMS Vans wheelchair van, all AMS Vans customers can list in our mobility classifieds for free the first month. 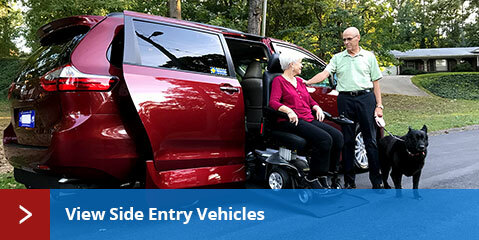 Use our mobility consignment program and allow us to list your handicap van in our mobility classifieds with an expertly worded ad and have all inquiries regarding the sale of your used handicap van routed to one of our mobility consultants to handle the sales process for you. By having an online wheelchair minivan lot, AMS Vans is setting the standard for a new kind of wheelchair minivan company that keeps more savings in your pocket and doesn&apos;t force you to pay for accessible features you may not need. Research what other handicap van customers think of AMS Vans in Terre Haute, Indiana and nationally by reading our handicap van customer testimonials. Once you are an AMS Vans customer, you can make $250 just for sending someone to us that buys a wheelchair accessible van and mentions your name during the sale. At AMS Vans, our goal is to get you on the road with a low cost handicap accessible van that is built with simplicity, longevity, and your safety in mind.